In December of last year, I got the opportunity to test drive the new Lexus ES 300h Limited. It’s in a market full of long wheelbase Germans offering various degrees of luxury sedans for any wallet size. Would the new ES 300H have what it takes to stand out from the crowd and make you rethink your options? 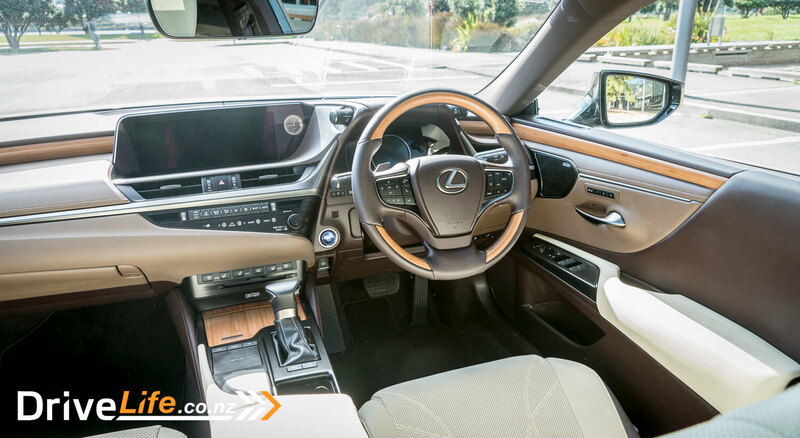 There are two models available in New Zealand for the Lexus ES, the 300h and the 300h Limited. The ES 300h starts at $76,990 and the ES 300h Limited starts at $92,990. The main visible difference between the two models are different wheels; the 300h comes with 17” alloys and the 300h Limited comes with 18” alloys. The second difference is with interior trim options; the 300h Limited has twice as many trim options to choose from. 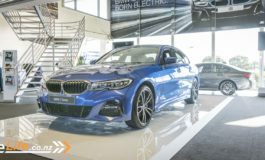 They both come with the same hybrid engine and produce the same power, 160kW and a combined fuel consumption of 4.6L/100km. The unseen differences are in the suspension; the 300h Limited is spec’d with front and rear performance damper, which are not available in the 300h. The 300h Limited also comes with triple-zone climate control, power rear window shade, heated steering wheel, dual-stage adaptive high beam system, rear cross traffic alert and blind spot monitor. The 300h has a 10-speaker sound system, while the 300h Limited comes with a 17-speaker Mark Levinson audio system. In the 300h the driver and passenger both have 8-way power adjusted seats with 2-way lumbar support. 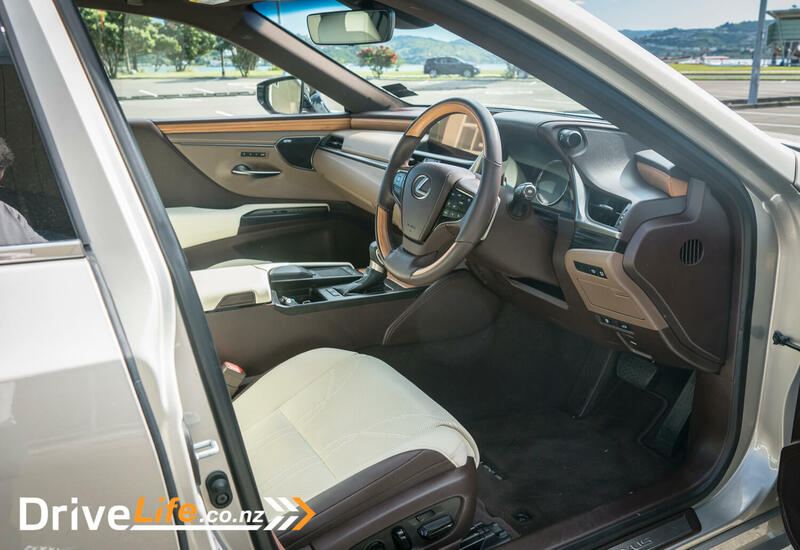 The 300h Limited comes with 10-way for the driver and 8-way power adjusted seats for the passenger, both have 4-way lumbar support. With a price difference of only $16,000, it would not be hard to justify the additional expense for the higher spec model. 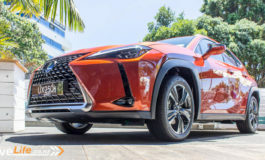 I like the Lexus brand, but I do sometimes wonder about the colour options they have available. 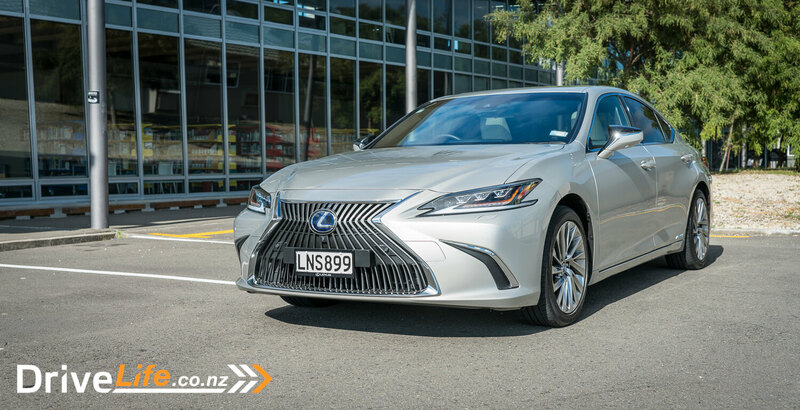 Knowing that the ES300h was a large luxury car that might be considered by professional businesses, you tend to find the colours can be a bit bland. As expect once I got to the dealer, the car was for want of a better word, a watery silver. I found out later that the name of this colour was Ice Ecru. It’s not a bad colour, nor is it a great colour. However, I grew to like the exterior colour more once I got into it. The interior was cream, brown and bamboo. This interior package was called Rich Cream and Bamboo, which I really didn’t like. My wife nailed it in one: cream and baby poo brown. This car would have looked so much better in black and bamboo or black and Shimamokua, which is black leather and dark wood finish. Mixed feelings to this start, but I must remember its an option which can be changed and that there are people out there that like this combination too. Personally, I would have selected the Deep blue exterior paint with the black and bamboo interior finish. Regardless of the colour selection inside the ES 300h, the interior was really nicely laid out and had a good quality finish to it. The colour did make the cabin feel bright and spacious, but it was still hard to like that much brown. The central console widescreen was nicely set into the dash with some other features from the Lexus model range. The LC dails left and right above the instrument cluster were a really nice touch. There were not a lot of buttons or feeling of clutter in the cabin, I found that you had just what you needed and the rest was hidden away in optional menus. I did however had one issue with the bamboo, which looked good, but the end of the dash had a brown plastic cap on them which totally destroyed the look of it trying to be real bamboo. My 2 cents to the design team would be to run the pattern around the corner and not have the caps at all. It was great to see the trackpad back in the ES300h, first tested in the RC when it was released a few years ago. I personally prefer this system of interactivity with the media system, over the mouse or dail like systems. This feedback touch pad is so easy to use even when you’re not looking at it. Thanks to the feedback system, as you move your fingers around the screen there is a feedback pop to your finger when you move over a button. This makes it easy to move through the menus once you are used to their locations, as it’s just by number. 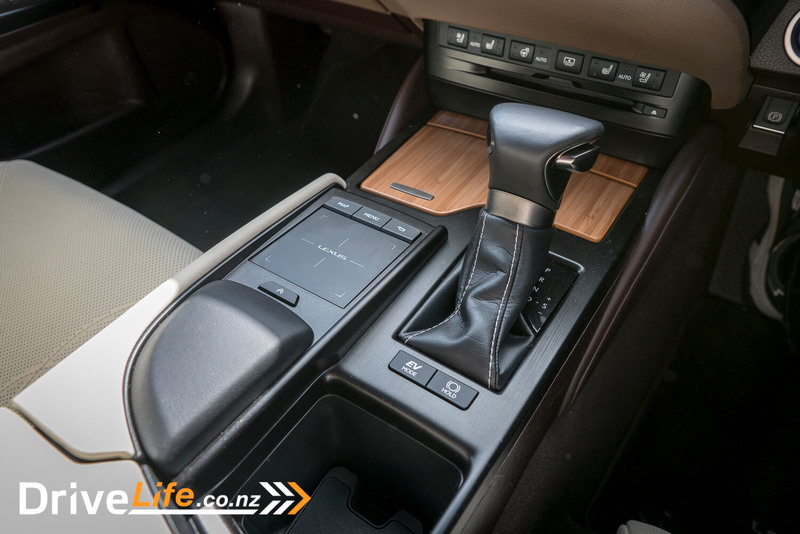 It’s also a nice clean designed pad, which sits nicely into the centre console. The steering wheel has seen some updates too, thankfully the cruise control buttons has been moved from the awkward stalk to the wheel itself. This made me happy, as I never like that stalk and always felt like it was a difficult way to use cruise control. Even though this car is running a CVT gearbox, it spec’d with gear selection paddles on the wheel. It’s really not needed or of any use in a car like this. Inside the back is where some of the magic seemed to be, as the environment changed a lot from the front seats. In the front you are in charge, in control, but in the back you are being looked after, and escorted to your destination. The space in the back was rather surprising, even for a guy of my height. I was able to sit back and even stretch out my legs. As I was sitting behind the front passenger seat, I even had the ability to move the front seat further out of the way by the button on the side of the front seat. Pretty cool idea, but probably not ideal for kids. The sound system in the limited was exceptional, the 17-speaker Mark Levinson system is hard to beat for overall audio clarity and range. I also like that its setup not to hear the sound from each speakers location, but to hear it combined in your head. This may sound odd, but there is a difference, when you can pinpoint the location of the speaker by the sound it makes, it’s not ideal. I did not have this problem in the ES 300h Limited. The boot was a nice generous size with a good opening. Not as deep as I would have hoped for a big car like this. It’s a power open and close boot lid, which can also be opened via the key fob. 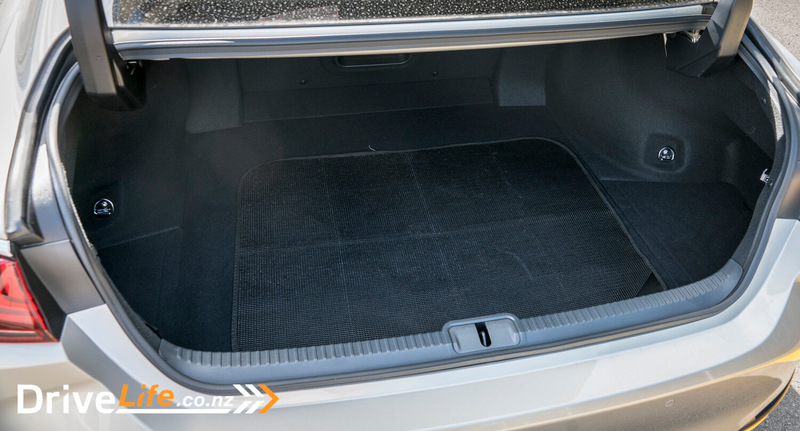 As standard it comes with the Lexus anti slip cargo mat and safety kit. The big question for me was around the engine: would the new 4-cylinder hybrid engine be enough to pull around this big, heavy car. I was surprised to find that it was enough, if only just enough. Around the city the hybrid engine worked amazingly well, allowing smooth starts from traffic lights until additional power was required from the engine. It’s not a car to drive fast in, but when you do need some power it is there. Getting onto the motorway I put my foot down to see what would happen. Overall pickup was good, nice steady acceleration up to the speed limit. The engine did get a bit noisy when in the higher rpm, it was not irritating, the sound was just unexpectedly high for a big car, as it’s a small engine. All of the safety and information systems worked well together for the driver. 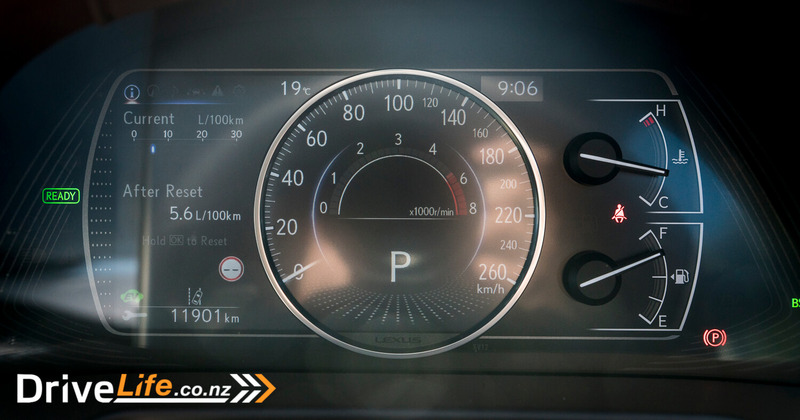 Blind spot monitoring, lane assist, cruise control setting were all nicely laid out on the head up display. I found that I never needed to look at the main instrument cluster that much at all. There is a section of motorway under construction between Porirua and Tawa which has a horrific temporary road in place for day to day traffic. This temporary road is very bumpy and it has been a good section of road for me to test how well different cars handle it. Some do ok, and some are really bad. But the ES 300h Limited surprised me as we drove along this section of road at the temporary speed limit of 70kph. It was almost like the road was smooth, which i knew all too well it was far from being smooth. But the ride and feedback in the car were of a nice, slightly undulating road. I was impressed, as the only other car to come this close to smoothing out the road surface was the Mercedes-Benz S-Class. To sum it up, driving the 300h Limited was somewhat boring. I choose this word carefully as it does not mean its bad, just not interesting. For a car like the ES300h Limited, this is exactly what you want. I don’t recall a single thing I didn’t like about driving this car, nothing annoyed me, nothing frustrated me either. It did everything I wanted and asked from it, and it did it in a refined hybrid-car way. I never expected it to be exciting; it’s a hybrid and a LWB luxury sedan. It’s goals are different, which are all about bringing the driver and passengers to their destination in relaxed luxury environment. I had been invited to a large company’s end of year Christmas party, and thought what better way to go then to be dropped at the door in a luxury Lexus. I had to ask Fred from the DriveLife team to help and drive us into the event. From the rear seats the car feels enormous, with heaps of space and a very nice sized centre armrest. 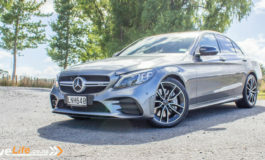 The entire feeling from the rear was of luxury and comfort, and the ride quality was second only to the recently tested Mercedes-Benz S Class at three times the price. How it handled the bumps in the road was impressive. When we arrived at the event it was nice to see that we were the only one arriving like this, amongst a sea of white Prius taxis. It turned heads, as people wonder who was arriving in that car, which showed us that it’s not always the type of car you arrive in, but how it looks. The LWB market is a niche one, but there are a couple of similar options out there. As you can see there is a rather large difference in price between the typical German models and what Lexus offers. We all know that the selected interior colour was not for me, but the car as a whole was rather impressive. More so than I thought it was going to be. After testing life in the back seats, it really changed my perspective of the car and its purpose. Is it a good family car? Probably not, but it is a perfect car for businessmen who might need to work on the move, loads of space in the back, a smooth ride and quiet cabin. The downside was the interior and exterior options, I felt they were a bit limited compared to some of the other vehicles available in the market. 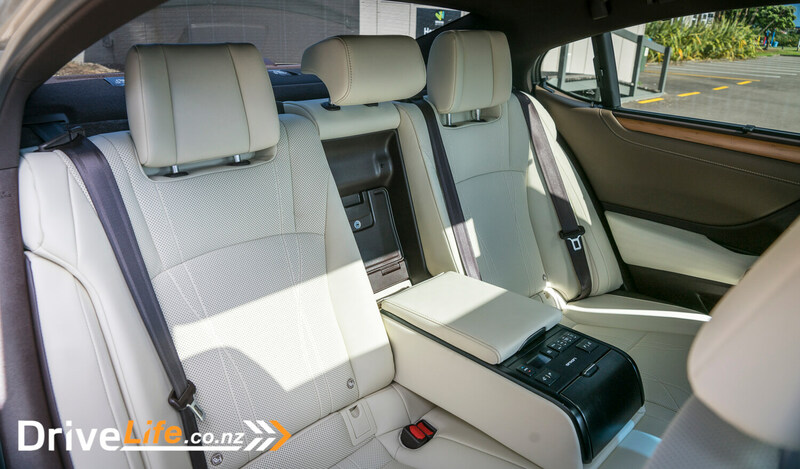 For such a big heavy luxury vehicle the ES300H drives really well offered a smooth passenger experience and elegant comfort. 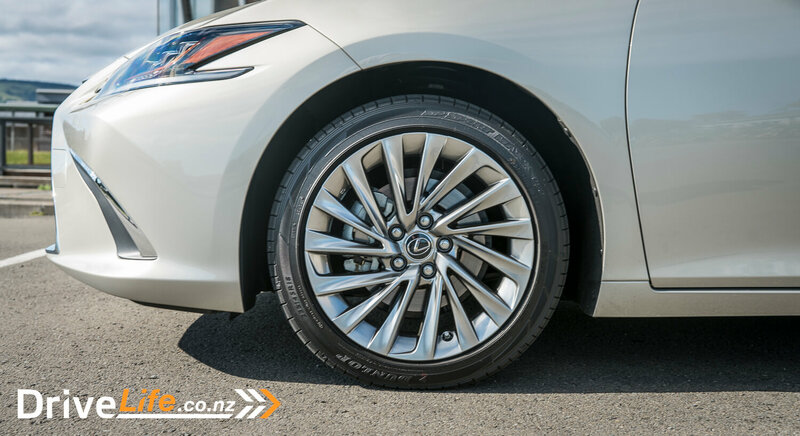 If you’re after a LWB luxury car, the Lexus ES300h is worth checking out.